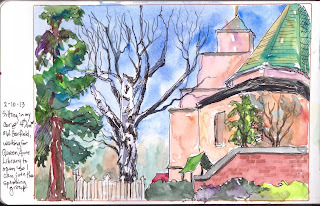 Urban Sketchers Seattle: Queen Anne and Ballard neighborhoods. Tacoma, too! Queen Anne and Ballard neighborhoods. Tacoma, too! 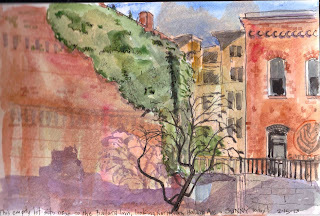 Sunday I went up to the Queen Anne area to join my wool spinning group. 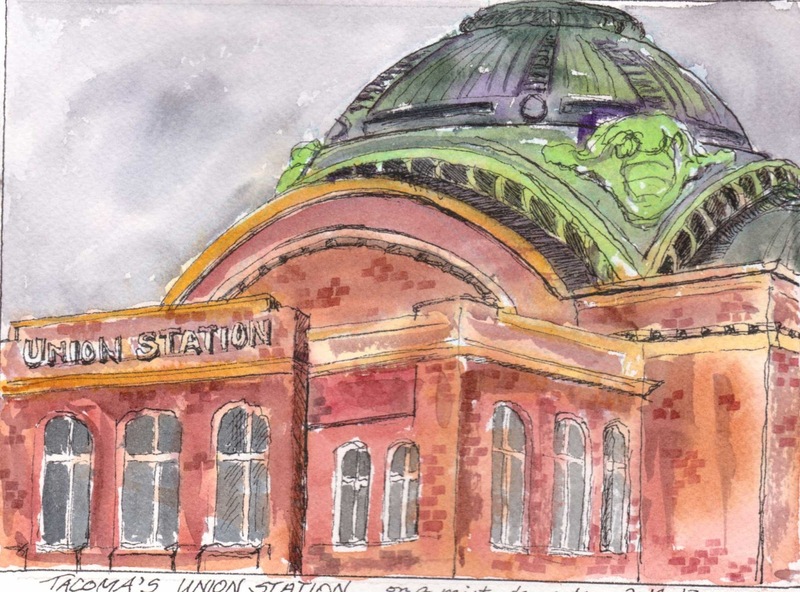 I had planned to arrive early, so I could sketch the Carnegie built public library, but as I pulled up to the library, the dramatic scene greeted me. It was so compelling with that huge old Birch tree, and the backdrop of the United Methodist Church. 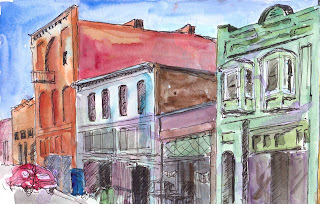 I was looking west, as I sat at the corner of 4th Ave. W. and W. Garfield St.
Thursday I drove to Tacoma because there's a big fiber festival going on, so I thought I would use that excuse to try sketching some of Tacoma's old buildings. Even though it was a misty, dull gray day, I managed to park close enough to Union Station to be duly impressed with the beauty of that dome! Today, Friday the 15th was a huge GIFT!! Seattle was shining in all her glory! - and it was warm, too! 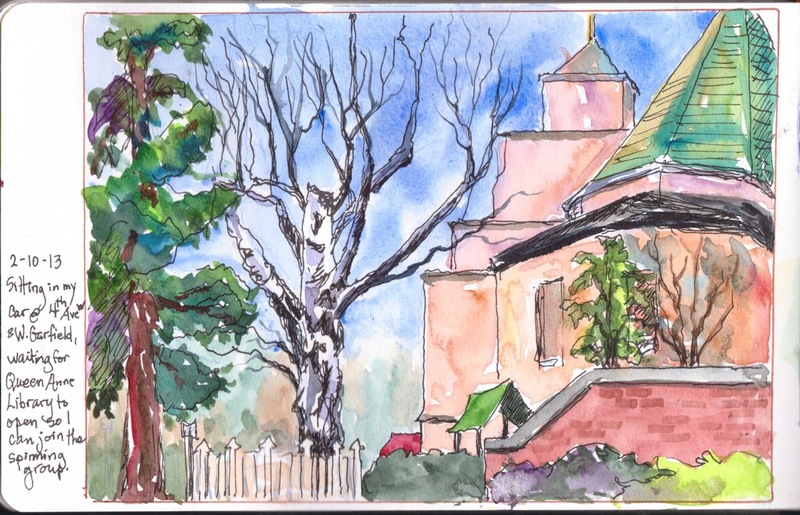 Since a fellow sketcher was visiting from Vermont and wanted to sketch with us, 6 of us Seattle sketchers met with her in Ballard on Ballard Avenue, that street with all the wonderful old buildings so full of character between 20th Ave. and 22nd Ave. 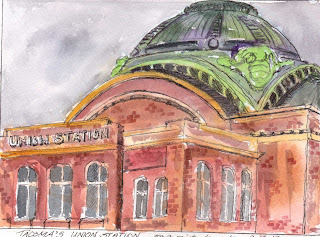 Thanks to Tina giving me a ride, we arrived almost an hour before the appointed time, so I was able to get a couple good watercolor sketches in, plus a small pencil sketch. In this empty lot sketch, I was drawn in by the wonderful shadows dancing on the brick wall. With all the plain gray days we've been having (and thus no strong shadows!) it was such a pleasure to play with shadows. This other sketch looks like it was done after someone cleared all the cars off the street! - NOT! Like Tina, I seem to have great difficulty with cars. Maybe I need to give my self a challenge of sketching 30 days worth of cars!! Wow, you've been busy, Peggy! All great sketches! These are fantastic! 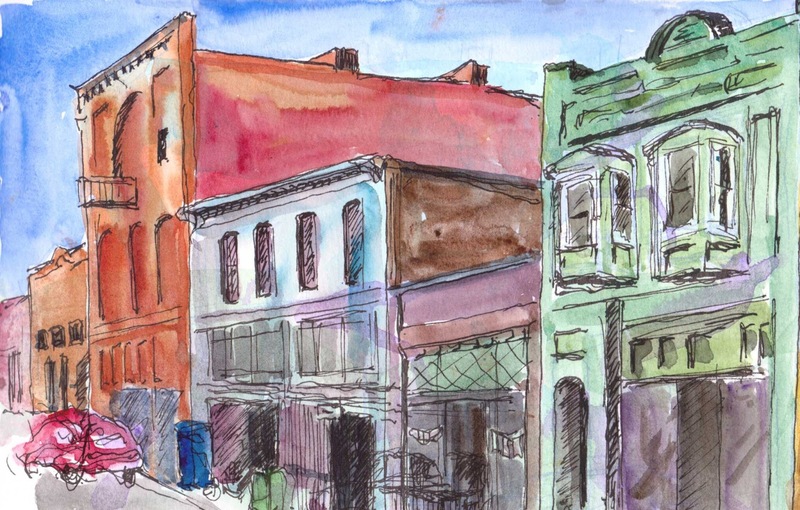 I envy your eye for sketching buildings. Wonderful perspectives and color contrasts.